A late night out meant I was in need a nightcap drink on my return home. 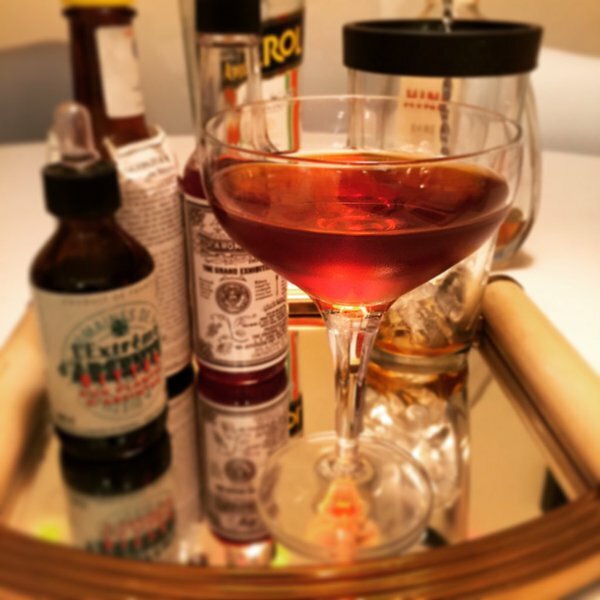 This drink seemed to fit the bill, being just a mix of spirits and fortified wine, a little like a whisky Manhattan. It also gave me an excuse to use some more of my Tawny Port and a new bottle of Whyte & Mackay blended scotch. This blend seems to polarise opinion on a few whisky sites; people either like it or really hate it. I find it a little sharp and one-note as a whisky, with a strong alcohol ‘burn’ on the tongue. The flavour is good, if a little weak, so it’s a decent enough blend to mix with. The drink is simple enough: one measure of whisky, one of port and a few dashes of cognac. At first taste, the drink is a little disappointing: the spicy notes of the tawny port jar with the whisky, and the combined fruit flavours of the port and alcohol of the whisky just don’t sit well together. But after a few minutes on ice, something happens: suddenly everything comes together and the flavours really blend. Perhaps this in one of those drinks that would be good to age together for a few weeks before drinking. Store the ingredients together over ice, then strain into an old-fashioned glass over fresh ice and garnish with a slice of orange peel.